This check should be carried out when heavy loads (or reactions) are applied to unstiffened webs, e.g. it applies to beams supported on the bottom flange with the load applied to the top flange; to a column supported by a beam; to a beam continuous over a column; and to web resisting compression forces from haunches in portals. 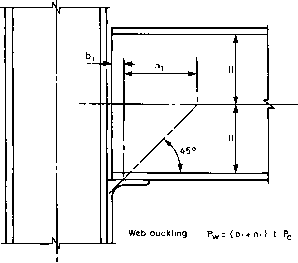 Web buckling and bearing may be checked as described below, the dimensions being shown in Fig. 29.
where Z>, is the length of stiff bearing is as shown on Fig. 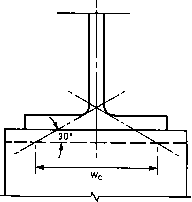 29 t is the web thickness pc is obtained from Table D3 using X = 2.5 d/t (where d is the depth of web); provided that the flange through which the load or reaction is applied is effectively restrained against rotation relative to the web and lateral movement relative to the other flange; if these conditions are not met, BS 5950 should be consulted. Pw is the web buckling resistance of the unstiffened web Pyv, is the design strength of the web m2 is as shown in Fig. 29 tc is the thickness of the cleat fVc is as shown in Fig. 29. 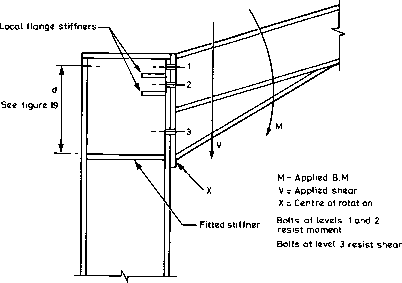 What is stiff bearing length? What is web bearing and buckling? What is a stiffened or unstiffened web?